#1. This week's number one is former international swingman Jamal Murray (198-97, college: Kentucky, currently plays in NBA). He led Denver Nuggets to a victory over the Boston Celtics (6-4) 115-107 in the NBA in Monday night's game. Murray was MVP of the game. He scored 48 points (!!! ), had 5 rebounds and dished 4 assists in 38 minutes on the court; quite an impressive performance considering it's only Murray's third season in pro basketball. The Denver Nuggets have quite an impressive 9-1 record this season. It was his team's fifth consecutive victory in a row. But this is still an early stage of the season and everything may happen. Murray has individually a very good year with high stats. He averages: 15.7ppg, 4.4rpg, 3.3apg, 1.1spg, 3FGP: 27.5% and FT: 89.7% in nine games he played so far. Murray played for the Canadian senior national team three years ago. #2. Second place goes to former international forward Kyle Wiltjer (208-92, college: Gonzaga, currently plays in EuroCup). He was the major contributor in a 1-point Unicaja Malaga's victory against the sixth-ranked Fiat TO (0-5) 105-104 in the Eurocup last Wednesday. Wiltjer scored 17 points, grabbed 5 rebounds and dished 4 assists; not bad, considering it's only his third season in pro basketball. 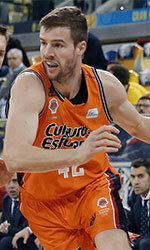 Unicaja Malaga (4-1) is placed first in group D. It was his team's fourth consecutive victory in a row. Wiltjer has relatively good stats this season: 10.6ppg, 3.6rpg, 2.2apg, 2FGP: 55.6%(10-18), 3FGP: 34.8%. He played for the Canadian national team in 2015. #3. The Canadian player who performed third best last week abroad was an international forward Tristan Thompson (206-91, college: Texas, currently plays in NBA). Thompson could not help the Cleveland Cavaliers (1-9) in their last game. Despite his very good performance the Cleveland Cavaliers (1-9) were edged 102-100 on the road by the Orlando Magic. Thompson had a double-double by scoring 19 points and getting 16 rebounds. He also added 4 assists in 34 minutes. It was Cavaliers' third consecutive loss in a row. But the season just started, so everything may happen. It's Thompson's eighth year with the team. This season Thompson has relatively solid stats: 7.9ppg, 8.9rpg, 1.9apg, 2FGP: 47.8% and FT: 58.3% in nine games. He is also a member of the Canadian senior national team. #4. Shooting guard Brady Heslip (188-90, college: Baylor, currently plays in EuroCup) was not able to help Deutsche Bank Skyliners (3-2) in their last game on Wednesday. Despite Heslip's very good performance the third-placed Deutsche Bank Skyliners (3-2) was edged 83-80 in Kazan by the second-ranked Unics in the group D of Eurocup. He was the top scorer with 25 points. Heslip also added 3 assists. This season Heslip has very high stats. He averages: 15.6ppg and 1.4apg. Heslip is also Canadian national team player. #5. International guard Xavier Rathan-Mayes (193-94, college: Florida St., currently plays in Basketball Champions League) contributed to AEK's victory against the sixth-ranked JDA Dijon (1-3) 90-80 in the Basketball Champions League last Tuesday. He recorded 15 points and grabbed 4 rebounds in 31 minutes. AEK Athens (3-1) is placed second in group C. It was his team's third consecutive victory in a row. But the season is still in it's first stage and everything can happen. It's Rathan-Mayes' first year with the team. Rathan-Mayes has reliable stats this season: 14.5ppg, 2.8rpg and 5.5apg in four games. He used to play for the Canadian national team last year. #6. Point guard Kevin Pangos (185-93, college: Gonzaga, currently plays in Euroleague) contributed to an easy victory against the 14th-ranked Maccabi T-A (1-4) 74-58 in the Euroleague on Thursday night. Pangos scored 7 points and added 6 assists. FC Barcelona Lassa (3-2) is placed eighth in the Euroleague. It was his team's third consecutive victory in a row. But there are still lots of games to play and it's a long way to go. Pangos' overall stats this season are: 7.8ppg, 1.6rpg and 4.2apg. He is an international player who is currently on the senior Canadian National Team roster. #7. 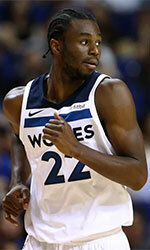 Former international guard Andrew Wiggins (203-95, college: Kansas, currently plays in NBA) was not able to secure a victory for the Minnesota Timberwolves (4-7) in their last game on Friday. Despite Wiggins' very good performance the Minnesota Timberwolves (4-7) were badly defeated 116-99 in Oakland by the Golden State Warriors. He was the top scorer with 22 points. Wiggins also added 4 rebounds. Wiggins is one of the most experienced players in a team as it's his fifth year in Timberwolves' roster. This season he has very high stats. Wiggins averages: 17.3ppg, 3.7rpg, 1.5apg and 1.5spg. He used to play for the Canadian national team three years ago. #8. Guard Daniel Mullings (189-91, college: N.Mexico St., currently plays in Finland) was the main contributor in a 3-point Joensuun Kataja's victory against the closely-ranked KTP-Basket (2-5) 87-84 in the Finnish Korisliiga on Sunday night. Mullings was the best player in that game. He had a double-double by scoring 22 points and getting 14 rebounds. Mullings also added 3 assists and 3 blocks in 32 minutes. Joensuun Kataja Basket (2-2) is placed sixth in the Korisliiga. 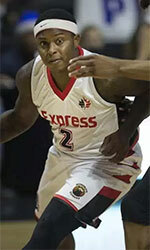 Mullings has very impressive stats this year: 15.3ppg, 10.0rpg, 3.3apg, 1.3bpg and 1.3spg in three games. He used to play for the Canadian national team back in 2015. 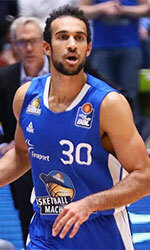 #9. International guard Philip Scrubb (191-92, college: Carleton, currently plays in EuroCup) couldn't help Zenit (3-2) in their last game on Tuesday. Despite Scrubb's good performance Zenit (#3) was crushed 89-68 in Villeurbanne by the second-ranked ASVEL Lyon- Basket in the group C of Eurocup. He was the second best scorer with 13 points. Scrubb also added 5 assists. Scrubb averaged so far 12.0ppg, 2.4rpg and 3.4apg. He is also in the roster of the Canadian national team. #10. Point guard Kaza Kajami-Keane (185-94, agency: Interperformances, college: Cleveland St., currently plays in Holland) contributed to an easy victory against the sixth-ranked Leeuwarden (3-3) crushing them 105-59 in the Dutch Eredivisie last Saturday. Kajami-Keane scored 17 points and had 4 steals in 23 minutes. 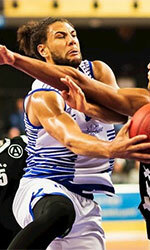 Landstede Basketbal Zwolle (6-0) is placed first in the Eredivisie. So far his team won all six games in the Regular Season. Kajami-Keane has very impressive stats this year: 19.5ppg, 6.5rpg, 2.8apg and 2.3spg in four games. He is an international player who is currently on the senior Canadian National Team roster. #11. Former international center Robert Sacre (213-89, college: Gonzaga, currently plays in Japan) couldn't help Hitachi Sunrockers (2-10) in their last game. Despite his very good performance Hitachi Sunrockers (#6) was edged 85-83 in Chiba by the leading Jets in the East group. Sacre had a double-double by scoring 20 points and getting 15 rebounds in 39 minutes. Sacre has very impressive stats this year: 17.3ppg, 8.9rpg, 1.7apg, 1.3bpg and 1.3spg in 11 games. He used to play for the Canadian national team three years ago. #12. International forward Dillon Brooks (198-96, college: Oregon, currently plays in NBA) couldn't help the Memphis Grizzlies (5-4) in their last game on Monday. Despite Brooks' very good performance the Memphis Grizzlies were badly defeated 117-101 in Oakland by the Golden State Warriors. He was the top scorer with 18 points. Brooks' overall stats this season are: 6.4ppg and 1.9rpg. He is also in the roster of the Canadian national team. #13. Former U18 international point guard Kenny Chery (180-92, college: Baylor, currently plays in France) contributed to a Boulazac Basket's victory against the closely-ranked Pau-Lacq-Orthez 90-77 in the French ProA on Saturday night. Chery was the top player that evening. He scored 19 points and added 6 passes in 29 minutes. Chery has very impressive stats this year: 16.1ppg, 2.6rpg and 3.8apg in eight games. He used to play for the Canadian U18 national team eight years ago. #14. International power forward Andrew Nicholson (206-89, college: St.Bonaventure, currently plays in China) helped Sturgeons win their game against the 15th-ranked Bayi Rockets crushing them 103-81 in the Chinese CBA in Tuesday night's game. Nicholson was the top player that evening. He recorded a double-double by scoring 28 points and getting 16 rebounds. This season Nicholson has very high stats. He averages: 29.6ppg, 11.9rpg, 1.9apg and 1.1spg. Nicholson used to play for the Canadian national team last year. #15. Former U19 international swingman Trey Lyles (206-95, college: Kentucky, currently plays in NBA) is a teammate of previously mentioned Jamal Murray. But that was another game of his team in NBA which we would like to mention. Lyles helped Denver Nuggets win their game against the New Orleans Pelicans 116-111. He scored 17 points in 21 minutes. Lyles' stats this year are: 9.7ppg, 5.3rpg and 2.0apg in nine games. He used to play for the Canadian U19 national team five years ago. #1. Dejan Kravic (211-F/C-90, college: Texas Tech, currently plays in Basketball Champions League) contributed to a Virtus Bologna's victory against the eighth-ranked BBC Bayreuth (0-4) 74-67 in the Basketball Champions League in Tuesday night's game. Kravic had a double-double by scoring 10 points and getting the same number of rebounds. He also added and 3 steals in 33 minutes. Virtus Segafredo Bologna (4-0) is placed second in group D. So far his team won all four games in the Regular Season. It's Kravic's first season with the team. This year Kravic's overall stats are: 9.0ppg, 5.3rpg and 1.8bpg in four games he played so far. He has a dual citizenship: Serbian and Canadian. #2. Dylan Ennis (187-PG-91, agency: BeoBasket, college: Oregon, currently plays in Spain) led Andorra to a surprising victory over the third-ranked Real Madrid (6-1) 107-105 in the Spanish Liga Endesa on Sunday night. Ennis was the top player that evening. He recorded 17 points and added 3 assists. MoraBanc Andorra (3-4) is placed 11th in the Liga Endesa. It was his team's first victory after four consecutive loses. Ennis has individually a very good season with high stats. He averages: 17.9ppg, 3.7rpg and 2.0apg. Ennis is another player who holds two passports: Canadian and Jamaican. #3. 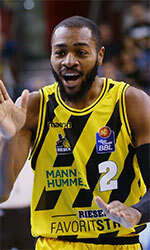 Kassius Robertson (191-G-94, college: Missouri, currently plays in Germany) could not help BBC Bayreuth (2-3) in their last game. 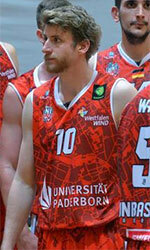 Despite Robertson's very good performance BBC Bayreuth lost 79-88 on the road to the lower-ranked (#15) ratiopharm Ulm. He was the top scorer with 19 points. Robertson also added 3 passes in 30 minutes. It's Robertson's first season with the team. This year his overall stats are: 5.0ppg and 1.3apg in four games. #4. Kiefer Douse (190-G-92, college: Canisius, currently plays in FIBA Europe Cup) was not able to help Leicester Riders (0-3) in their last game. Despite Douse's good performance Leicester Riders was edged 82-79 on the opponent's court by the second-ranked Szolnok. He scored 10 points, had 4 rebounds and dished 4 assists in 21 minutes. So far Leicester Riders lost all three games in the Regular Season. There are only three games left until the end of the FIBA Europe Cup Regular Season. So now every game will be critical. Douse averaged so far 13.3ppg, 4.0rpg and 3.0apg in three games. #5. Experienced Ali Kanaan (207-C/F-85, college: Mass.-Lowell, currently plays in Lebanon) helped Byblos win their game against the league outsider Hoops Club (0-3) crushing them 90-68 in the Lebanese LBL last Monday. He scored 8 points, had 4 rebounds and dished 3 assists. Byblos Sporting Club (1-2) is placed sixth in the LBL. Kanaan's team will play only one more game in the Regular Season. And now that game is very crucial. Kanaan has been at the team for six years. He averaged so far 13.3ppg, 4.0rpg and 3.0apg. Kanaan has both Canadian and Lebanese nationalities. #6. Ryan Wright (206-C/F-87, college: Oklahoma, currently plays in Finland) led Joensuun Kataja to a 3-point victory against the closely-ranked KTP-Basket 87-84 in the Finnish Korisliiga last Sunday. He scored 12 points and grabbed 4 rebounds in 27 minutes. Wright averaged so far 11.3ppg, 5.3rpg and 1.5spg in four games. #7. Billy McNutt (203-C/F-85, currently plays in Luxembourg) was the major contributor in Etzella's victory against one of league's weakest teams Sparta crushing them 88-68 in the Luxembourg Total League on Sunday night. He recorded a double-double by scoring 20 points and getting 10 rebounds. McNutt also added 2 blocks and 3 steals. This season he has very high stats. McNutt averages: 26.0ppg, 11.9rpg, 1.7apg, 2.0bpg and 2.1spg. #8. Chris Boucher (208-C/F-93, college: Oregon, currently plays in NBA) was not able to secure a victory for the Toronto Raptors in their game against the Milwaukee Bucks in the NBA. He scored 6 points in only 2 minutes. It was his first game for Toronto Raptors this season. His team lost 109-124 in the NBA. Boucher also holds two passports: Canadian and Saint Lucian. #9. Luka Zaharijevic (202-F-95, college: UBC, currently plays in Czech Republic) led NH Ostrava to a victory against the league outsider Kralovsti sokoli 97-83 in the Czech Republic NBL last Saturday. He scored 11 points and grabbed 5 rebounds in 20 minutes. This year Zaharijevic's overall stats are: 10.0ppg, 7.3rpg and 1.3apg in eight games. #10. Aleksandar Danilovic (202-F-93, currently plays in Portugal) helped Ovarense win their game against one of league's weakest teams Illiabum 75-67 in the Portuguese LPB on Saturday night. He scored 7 points and grabbed 8 rebounds. This season Danilovic has very high stats. He averages: 15.2ppg, 5.6rpg and 1.2spg. Danilovic has Canadian and Serbian nationalities.